With rising geriatric population, monitoring older adults passively in their own living settings through placing sensors in their living environments or the objects they use is of utmost importance. In-home monitoring technology add on the benefit of measuring individualized health status and reporting it to the care provider and caregivers alike, allowing timely and targeted preventive interventions, even in home and community based settings The wearable biosensors market is expected to exceed more than USD 26.4 billion by 2025 at a CAGR of 8.12% in the given forecast period. The automobile industry has undergone a revolution in the recent past and cars are practically higher end microprocessors on wheels and so on In-car health and wellness monitoring will become the key differentiator, for instance, Tata Elxsi’s proven expertise in biomedical instrumentation ably supported by industrial design and car diagnostics can offer excellent solutions for the challenges posed by the in-car wellness/ health monitoring applications. However, lack of versatility, smaller size and less penetration among the population tends to hamper the wearable biosensor market. Further, the major challenge for the global wearable technology is to tackle with the security and privacy issues. As the wearable are connected over internet, it can be hacked in its application and the data stored can be stolen, posing high risk to the citizens as well as to the nation. Health & wellness monitoring dominated the market and accounted for the market share of 27.35% in 2017. Monitoring and timely intervention are extremely important in the continuous management of health and wellness among all segments of the population, but particularly among those with mild dementia. Home diagnostics is the major end user segment and accounted for the highest market share of 30% in 2017 in the global wearable biosensors market followed by point of care testing and hospitals owing to wearable biosensor advances in data analysis and artificial intelligence techniques which are responsible for paradigm shift in remote management and monitoring of chronic disease. On the basis of region, North America dominated the wearable biosensors market on the back of available advanced technological infrastructure, thus major manufacturers are present in this region and increased spending on wearable technology in healthcare, fitness and security. Europe & APAC are the fastest growing region due to increase in demand of automated wearables that can keep daily track and consumer awareness regarding benefits of wearable biosensors. Latin America and Middle East & Africa tends to grow at substantial rate owing to increase in demand of fitness devices with low cost and increased benefits. Global Wearable Biosensors Market Outlook 2017-2025, has been prepared based on an in-depth market analysis from industry experts. 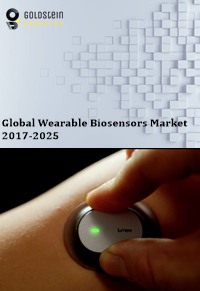 The report covers the competitive landscape and current position of major players in the Wearable Biosensors market space. The report also includes porter’s five force model, SWOT analysis, company profiling, business strategies of market players and their business models. “Global Wearable Biosensors Market Report” also recognizes value chain analysis to understand the cost differentiation, pricing models to provide competitive advantage to the existing and new entry players. Our Global Wearable Biosensors Market Report comprises of the following companies as the key players: Google Inc., Microsoft, SAMSUNG, Apple Inc., VitalConnect, Huawei Technologies Co., Ltd., Withings SA, Robert Bosch GmbH, Broadcom, Infineon Technologies AG, mCube, Inc., Knowles Electronics, LLC., Panasonic Corporation, TE Connectivity Ltd., Asahi Kasei Corporation, NXP Semiconductors, Invensense, Inc., Texas Instruments Inc, ARM Holdings PLC, Vancive medical technologies, Jaw bone, Tactio health group, and Zephyr.